The York portering Chair is a compact porter chair, mounted on 315mm wheels with a fully adjustable brake assembly at the rear and 100mm castors on the front. 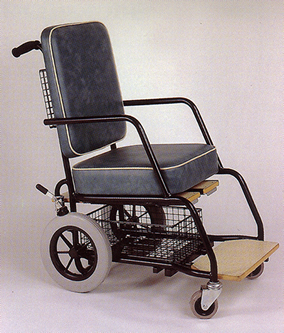 This configuration of wheel at the rear, castor at the front makes the chair very manoeuvrable and easy to use. The standard chair has fixed arms, full-width tip-back footboard, together with baskets underneath and on the back of the chair to carry the patients belongings.